On the left is a self-healing stitch pattern. I’ve removed two rows of love knots, and the stitches left behind are fine the way they are—I have not edged them. No “lifeline” was required to prevent unraveling. On the right, a red lifeline has been woven into the base loops of some of the double crochet stitches (dc, or in UK: tr). The nearby stitches without a lifeline are unstable and will unravel. View full size. The Self-Healing Crochet Stitches and How to Cut Them class is thanks to an accidental discovery I made in 2013. A rectangular wrap kept sliding off of my shoulders. It has interesting edges, so I added (cut open) armholes to wear it as a vest. The cut that launched a whole class! At first I thought it was an odd quality of only a few kinds of Tunisian stitches. After testing why this happened, I created a class called “Steeked Tunisian Lace for Fun Fast Fashions”. By the time I taught it (2016), I’d already discovered the same effect with some regular crochet stitches. That led to a new version of the class​​, “Easy to Steek Crochet Stitches” in 2017. Nowadays I’m thinking “self-healing” conveys the topic better than referring to steeks. Steek is a specialized knitting term. I see too many question marks over crocheters’ heads when I use it. Also, steeking often involves cutting across several rows whereas in my class we cut open ONE row. Cutting a self-healing stitch is creatively liberating and empowering. For me as a designer it’s exhilarating! I think “self-healing” conveys some of the positive, low-stress feeling people have in this class. My friend ​Pauline Turner will be teaching a class​ called “Cutting Crochet” at the same event on ​Thursday, ​July 26.​ Our two “how to cut” classes seem to be very different​. When renaming my class I briefly considered “Cutting Crochet” as a way to avoid the steek term. I worried that it would bring to mind the traditional reasons a crocheter would need to cut crochet: to fix, tailor, or repair it. My class is not traditional. “It’s a Game Changer” — Vashti’s mom (crocheter). It changes what we can do with schematics and simple shapes. Beginners can understand and use the basic principles of it. It simplifies the crocheting: just keep crocheting to the end. No need to make sure you start the armholes in the correct row. Stop crocheting when you want to, not when you’re a fixed distance from an opening. The opening you add later is actually superior to crocheting it in as you go. It’s less lumpy. It’s certainly a game changer when doing planned pooling with a variegated yarn (argyling, color stacking, etc). Crocheting a simple shape straight through is really important for this kind of crocheting. If you were to add an opening as you’re crocheting, you’d throw off your color sequence. To be able to cut open armholes, a head opening, pocket slit, and even a scarf keyhole later is ideal. It turns out that a large number of stitch patterns are, or can be subtly tweaked to be, self-healing. Self-Healing Crochet Stitches and How to Cut Them has a 2018 class resources page. Pattern schematics inspire me to steek crochet. I wish every crochet garment pattern offered a schematic. It outlines the sections of a garment, like puzzle pieces. Schematics cut through illusions cast by fashion photography and lovely models. A single pattern schematic can distill a fancy design to its simplest essence. 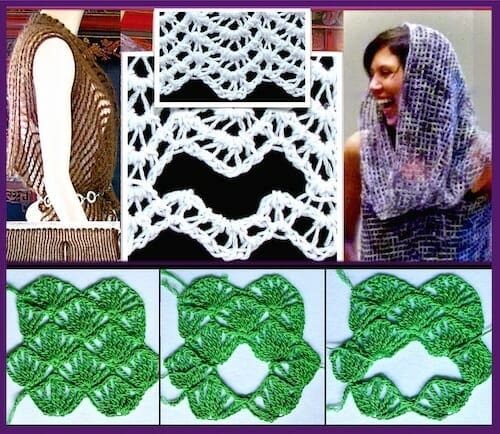 I created two Pinterest boards of things that inspire me to steek crochet: Steeks: Ideas and Wearable Simple Shapes. Schematics also cut through language barriers. I can understand a non-English pattern if it includes a good schematic or two. Steek where the pink bar is in these pattern schematics for simple-shapes garments. Update! I wrote newsletter #80, Pattern Schematics for Insiders & Outsiders, three months after I wrote this blog post. Note that shop links in its right-hand column are outdated as of Sept. 2017. A schematic is sensational to me when a garment that looks chic on a model, yet its schematic reveals that it’s made of simple shapes like rectangles. It’s exciting because every crocheter or knitter first learns how to make rectangles, right? Sometimes all you need is a rectangle that drapes, or is clingy/stretchy (or all of these). Sometimes weightlessness brings it home, other times it’s a luxuriously weighty swing. The schematic tells you what’s what when you know what to look for. Sometimes the key to chic is a well-placed seam on a simple shape. Sometimes it’s a special edging. And sometimes it’s the where and how of the steek. Steek crochet for the easy chic of it. I love this conference prep blogging because it makes me aware of things that I’ve done for years, like collect pattern schematics. There’s more than one way to reinforce a cut made into crochet stitches because there’s more than one kind of steek, and use for that steek. Here are just two kinds of projects made in the same stitch pattern. I added a keyhole to a pink Mesmer scarf. The two yarns in this first stitch close up are a lace weight mohair and a worsted weight sequined silk. I used the cut yarn end to reinforce the opening. Both of the projects are part of the Mesmer Tunisian Veils pattern. If you steek crochet stitches the easy way—within one row—you have at minimum two yarn ends to fasten securely and then weave in. Some Tunisian stitches will cause you to have more (see newsletter #79 about that). The more stitches you unravel, the larger the hole and the longer the yarn ends will be. I only unraveled 3 of the pink stitches and that left me with yarn ends that were just long enough to work with comfortably. If the steeked crochet hole won’t be getting a lot of direct wear and tear, use those yarn ends to reinforce just the stitch at each end of the slit. See where I’ve woven the fine mohair yarn in and around the stitch? It will get light wear. Crochet-reinforced steek for an armhole. You’re looking at an edged armhole of a brown Mesmer Vest that was designed for Interweave Crochet Magazine. An armhole needs more reinforcement because of the constant pressure it supports in a garment. I switched to a double-ended circular crochet hook to crochet a few rounds of the same Tunisian stitch. It has a nice cap sleeve look when it’s worn. In the future I’d love to try longer sleeves this way. This post is part of my blogging goal of 50 posts for these 50 days of epic crochet conference prep. I’ve missed a day here and there lately because my dear friend from college is here for the week! We’re about to leave for the day to see the mermaids of Weeki Watchee. It’s a spring fed lake and water park.